Every single time I board a flight, I’m blown away by two things. One, that getting to travel to some of the most amazing places in the world is part of my job. It’s a dream come true and I never take it for granted! Two, that Thomas and I get to travel side by side. Being together makes everything, from the most beautiful scenery, to delicious local food, and even to the inevitable travel mishap, more rewarding and memorable. We’ve experienced many bucket list-worthy destinations, both domestic and international, together over the last few years, so in honor of Valentine’s Day coming up, we did some reminiscing to come up with our master list of the best romantic getaways. We have fond memories of each of these places, and whether you and your significant other prefer lounging on the beach or adventuring through the wilderness, I hope you’ll find a destination to add to your list below! The Amalfi Coast will always hold a special place in our hearts since we visited on our honeymoon. The views and beaches make it the perfect place to escape and relax. For a casual and adventurous getaway, we highly recommend Big Sur and Carmel, two places that highlight the very best of what the California coastline has to offer. For breathtaking beaches, colorful architecture, and a few of our all-time favorite hotels, we hardly make it home from Harbour Island before dreaming of our next trip there. Our Iceland trip, which was packed with jaw-dropping views, cozy meals, and incredible opportunities to experience nature in new ways, remains one of the greatest adventures to date. Crisp, fresh clean air, beautiful white tipped mountain ranges and fields filled with beautiful flowers and abundant wildlife are just a few of the things that make Jackson Hole so special. Add-on a fantastic downtown culture filled with art galleries, amazing cuisine and fun western vibe, and you have the perfect destination for the outdoor enthusiast. Quintessentially Maine in every way, we were charmed by the character and scenery of Kennebunkport when we visited in the fall, and would go back in a heartbeat to see it in every season. What could be more romantic than chateaus, lavender and sunflower fields stretching as far as the eye can see, and charming French villages? Loire Valley boasts all of the above and so much more. The blooming flowers alone make Nantucket a dream to visit, while the beaches, lighthouses, and delicious food solidify its position on our list of most idyllic summer destinations. We used to head to Napa for relaxing weekends away as often as we could, so its rolling hills and beautiful wineries are among the things we miss most about California. Gorgeous cliffside views, ancient castles, and quaint seaside towns make Northern Ireland as romantic as it is adventurous. I can hardly wait for my sister’s wedding here this summer! We’ve had the joy of visiting Paris multiple times over the past few years, and every time, we’re completely enchanted by its dreamy light, glorious food, and romantic streets. Everyone should have Santorini on their travel bucket lists–you can take in the magical views from practically anywhere on the island. Just a short drive from Charleston, we love stealing away to Savannah to spend a weekend relaxing in the beautiful parks, situated beneath dripping Spanish moss. For the ideal combination of beach lounging and plenty of adventure (from exploring volcanoes to hiking by waterfalls), we love everything the island of St. Lucia has to offer. Warm, sparkling blue waters, delicious food, beautiful accommodations and friendly locals makes it easy to fall in love with Tulum. 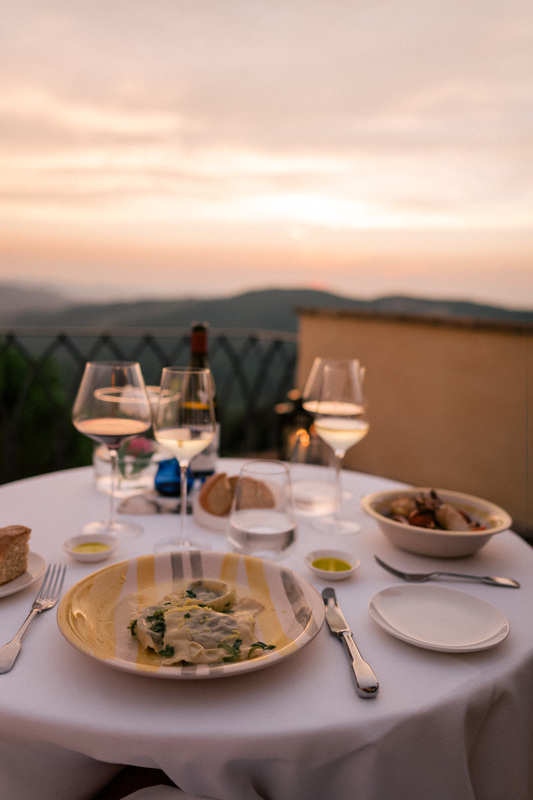 We could return to Tuscany again and again–the landscape, the wine, the food, and the architecture are like something from a dream. We spent our sixth anniversary in this magical place and reminisce about it often. Woodstock offers breathtaking scenic views and charm around every corner, making it an idyllic place to wander around together (especially in the fall). All the most romantic places have been listed in this post … I love ♥️it all! Fabulous post. I want to go everywhere. You should visit Marfa and the Big Bend. It’s so interesting. I’m not sure everyone will agree it’s romantic, but I think it is, as it’s so quiet, sunsets are quite beautiful and then you can go and see the art and take pictures. So many of these destinations are on our list! We have loved Napa & Kennebunkport. France & Italy are hopefully next! I am definitely adding several of these places on my bucket list! Hoping to visit some of these in the near future! All of these locations have been added to my travel bucket list! We’re hoping to book a last minute getaway in February, I’ll have to show my husband this list! You are an adorable couple! Italy and Iceland are on the top of my bucket list, I hope I can go soon! I really want to go to the Amalfi Coast next! this post definitely gives me the travel bug now! Great list but I’d add many more destinations from Asia especially Tokyo (or Kyoto and Hokkaido) especially during cherry blossom season (or really, during most time of the year) is absolutely magical. oh man, I won’t lie, but this makes me miss Tuscany Tom. All of these places are soo beautiful! <3 :) Thank you so much for sharing! These locations all sound so swoon-worthy! Happy to say I’ve been to one of them: Tuscany. Definitely adding some more of these to my list, as they sound lovely! Good tips! I was thinking of doing a tour of Ireland at somepoint in the near future. Will be sure to check out some of your suggestions though! These all sound like wonderful places to visit. I’ve wanted to visit the Amalfi coast for several years now.